McDonald’s first quarter profits slipped as U.S. sales declined. We are wising up to how their food contributes to poor health but they are fighting back by pouring more money into marketing. Much of that is aimed at our kids, even going so far as to use our schools and libraries for their marketing. 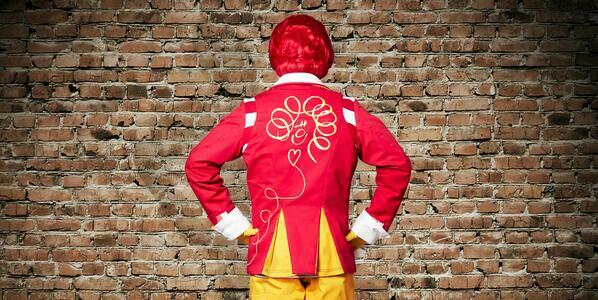 Notice the heart on Ronald’s new outfit to push the message that fast food = love and happiness. The company knows social media is having an impact on declining sales and is ramping up efforts on Facebook, Twitter, Instagram, etc. Let’s not let fast food marketers win this battle for our children’s health. We brought down their #cheerstosochi campaign and can do the same for #RonaldMcDonald. Don’t let one of the biggest alligators in the food swamp go unchallenged. Use your social media power to let McDonald’s know we are #momsnotlovinit. Tags: #CheerstoSochi, #MomsNotLovinIt, #RonaldMcDonald. Bookmark the permalink.